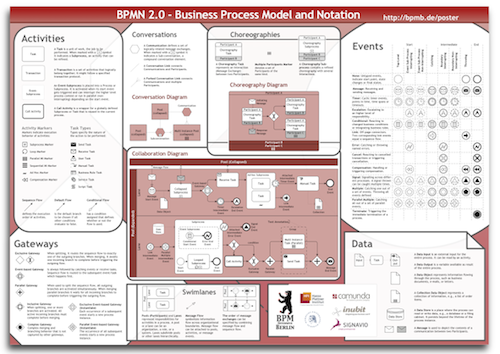 Our famous BPMN 2.0 Poster gives you a handy overview of the BPMN modeling elements. It was created by the "Berliner BPM-Offensive" and is available for download for free. Diese Seite wurde zuletzt am 27. Oktober 2015 um 11:57 Uhr geändert. Diese Seite wurde bisher 844.353 mal abgerufen.